The tonic of the bansuri is the note sounded when 3 finger holes are closed, 6 holes closed determines the key. The same flute may be referred to by either its tonic or key. Bansuri, Murali, Venu all are the name of Indian woodwind instrument flute. 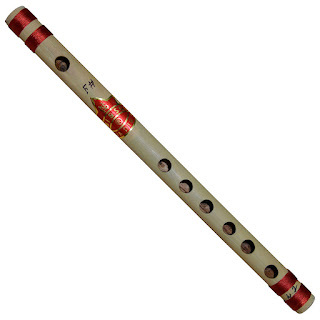 Indian bamboo flutes are the one of the oldest musical instruments of India. The Hindu God Krishna is traditionally considered a master of the Bansuri or Flute. The bansuri is made from a single hollow shaft of bamboo with six or seven finger holes. The Indian flutes are very simple compared to the western counterparts, they are made of bamboo and are keyless. And flute is a reedless wind instrument that produces its sound from the flow of air across of opening. The fingers of both hands are used to close and open the holes. It has a blowing hole near one end, and eight closely placed finger holes. There are two varieties of bansuri or flutes: transverse, and fipple. The fipple flute is usually played in folk music and is held at the lips like a whistle. Because it enables superior control, variations and embellishments, the transverse variety is preferred in Indian classical music. The size of a Bansuri affects its pitch. Longer bansuris with a larger bore have a lower pitch and the slimmer and shorter ones sound higher. In order to play the diatonic scale on a bansuri, one needs to find where the notes lie. For example, in a bansuri where Sa or the tonic is always played by closing the first three holes, is equivalent to D, one can play sheet music by creating a finger notation that corresponds to different notes. Please Note:- All flutes are in natural bamboo colour, and flutes may have some visible spots, scratches because they are not polished or coloured. These flutes are tuned to respective scales regardless the factor whether they are straight or have any minor bend. Each and every one of DronaCraft’s flute is built with a keen eye for tuning, tone and quality.